Enjoyable series, or as Daisy might say, "Just spiffing." Not nearly as good as the Maisie Dobbs series, it is still an enjoyable summer read. This one has the body of a serving girl found buried in an estate's garden. The town is ready to pin the murder on the Welsh gardener, but was it really him? I thought this one was fairly obvious from the get-go, but I still enjoyed it. A murder series set in 1920's Britain. This book has a paper-thin plot and pantomime characters. Not much attention to detail- lower class characters all seem to speak the same regardless of regional accents and I found the relaxed and very modern attitudes towards sexual relationships shown by the characters very unbelievable. 2.5 stars. Cozy mysteries are just so pleasant... even with a decomposing body in the garden. Digital audiobook read by Bernadette Dunne Book number two in the Daisy Dalrymple series has our heroine traveling to Occles Hall to research her latest article for Town and Country on England’s country manor houses. Lady Valeria is none too pleased at this intrusion, but Daisy IS “to the manor born” so she is tolerated. Still, when Daisy asks to photograph the winter garden the last thing she expects to find is a body. Daisy cannot help but get involved when she sees an injustice being carried out, so she convinces Alec Fletcher of Scotland Yard to investigate. There are a number of secrets being kept by the residents of the household and some are bound to come out in the process of getting at the truth of the murder. This is a charming cozy mystery series set in the 1920s. Daisy is charming, inquisitive, intelligent and resourceful. She does sometimes plunge headlong into trouble, but on the whole, she is appropriately cautious and responsible. I also like her slow-burning relationship with Fletcher. Bernadette Dunne does a fine job voicing the audio book. She has great pacing and enough skill as a voice artist to give the many characters sufficiently unique voices. I've read this series very much out of order, but I wanted to get a feeling for the first encounters that Daisy and Alec had. This is good. Lady Valeria is a serious Termagant, a Domestic Despot, with the side chuckle of being apt to use alliteration, even in the midst of her rants. Too bad that neither Daisy nor Alec were able to be witnesses to her eventual major smack-down, from both her unregarded daughter and her so-closely-coddled son. The Honorable Daisy Dalyrymple is visiting an old school chum while writing about her ancestral home when a body is discovered in the garden. Although the local police are happy to pin the housemaid's murder on her young foreign swain, Daisy has doubts. She calls in her childhood friend Philip Petrie and her new friend, Alec Fletcher of Scotland Yard, to help her investigate. Who killed Grace? Was it the beautiful but spineless heir who had gotten her pregnant? His best friend, the jealous Ben? His devoted sister, manipulative mother, or cowardly father? Grace's father or fiance? Or was it the travelling salesman who was seen talking to her only hours before she was killed? There are no physical clues. Only Daisy's stubborn will and insight into human nature can help her solve this case.This is not as good as the first Daisy mystery, Death at Wentwater Court. The main characters have already been introduced, so Dunn spends less time drawing them out. The murder itself is not one of those incredibly convoluted schemes that takes the latest forensic tech to solve. It is just a basic small village murder, and is simply solved by buying rounds of drinks at the village pub and interviewing suspects. The real delight to these books is the 1920s themselves, which Dunn draws with a deft and light hand. Reminders of a depressed economy, rumbles of discontent against the upper classes, growing independence for women, and the damages of the first World War are woven throughout. And the characters themselves are fresh and breezy. Daisy has a great deal of spirit and sympathy, but as smart and kind as she is, she is still very much a product of her upbringing--she can't bring herself to shingle her hair, or stop grouping people according to class. This is, overall, a murder as cozy as a murder can be, and well worth the few hours it will take to read. I didn't think this book was as good as the first one... Daisy is funny and, for the most part, an enjoyable character. And I have enjoyed Alec and Philip too. But the stories just aren't quite what I like. Add to that the bad language (mild, though it is) and the important roll that homosexuality played in the story and I'm thinking that I most likely won't be reading any more of these books.Warning: there is some bad language in this one and homosexuality plays a pretty important part in the story too. I picked this up the other night because I was wanting a mystery and it's set during the 1920s, probably my favorite historical era. It was just okay - a quick read for a lazy weekend. Although some of the historical details were interesting, the story wasn't too compelling and there were modern sensibilities that seemed out of place. I think I'm going to give up on this series. It looks to be one of those series where some sexual perversion is always woven in to the mystery and I'd rather not fill my head with those types of imaginings. Worum geht es? Miss Daisy ist wieder einmal unterwegs, um für eine Zeitschrift, ein Herrenhaus zu fotografieren und darüber einen Artikel zu schreiben. Die Hausherrin, ist ein echter Drache und Daisy ist ihr ein besonderer Dorn im Auge, ist es doch für ein Mädchen aus gehobenen Kreisen, in den 20er Jahren nicht schicklich, selber Geld zu verdienen. Pech für die schreckliche Lady, dass gerade jetzt im Wintergarten die Leiche eines Dienstmädchen aufgefunden wird. Natürlich muss Daisy ihre Nase wieder einmal in die Dinge stecken, die sie nicht angehen.Wie hat es mir gefallen? Ich mag den Charme der 20er Jahre sehr und die Charaktere sind mir auch in diesem Fall sehr sympathisch, bzw. wurden sehr gut entworfen. Beim Lesen bekommt man sehr gut vermittelt, was als guter und schlechter Ton zu dieser Zeit galt. Sowohl Setting, Charaktere und Story haben mir wieder sehr gut gefallen. Ich bin sehr gespannt, wie es mit Daisy und Inspektor Alec Fletcher weitergeht. This was a cute book! Daisy is such a fun character to read! Cute cozy mystery and it wasn’t til the end that I figured out who the murder was. Can’t wait to check out the next installment. Very fun mystery that takes you away, exposes you to a little history and a different way of living. This review pertains to the audio version of The Winter Garden Mystery. I bought the book not knowing it was the 2nd of the series so I put off listening to it until after I listen to the 1st (Death at Wentwater Court). Had I bought that book before this one, the Winter Garden Mystery would not have been in my library. So I admit I started this book with low expectations. Now for my thoughts on The Winter Garden Mystery. The non-recurring characters were not (for the most part) very well developed. The characters were mostly one dimensional with 2 of the characters almost making to two dimensional status. Almost. We didn’t get to know the murder victim at all because she was killed before the story started. We also knew very little about the murderer and the accused murder. I find it hard to care about characters I don’t know. We are given some backstory but not enough to get me interested in them. The plot was simplistic. Despite an attempt by the author to explain why several people could have killed Grace Moss, there were really only 2 options one of whom was not very believable as a murderer. The author attempted to explain why several people could be suspects. The explanations were not convincing. Even the character giving the explanations admitted that. The slang of the period was overused. It seemed like almost everything was spiffing old bean. Even riding in the dickey which, although uncomfortable, seemed to have occurred (or was at least thought about) with some regularity. So boring, underdeveloped characters tried to solve a nonmystery while driving to and fro with no petrol station in sight with someone sitting in the dickey of the car as they overused 1920’s slang. Definitely not the series for me. 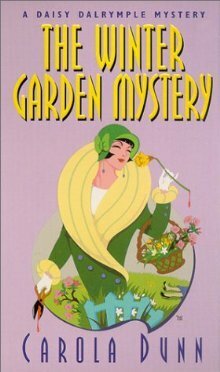 The Winter Garden Mystery by Carola Dunn is the second book in the Daisy Dalrymple series. I love how Daisy uses her position in society to write Magazine articles about houses. Of course she stumbles over another death and is horrified by the way Lady Valeria rides roughshod over the local police so that they immediately arrest the wrong person. Daisy eventually manages to have Chief Inspector Alec Fletcher come and solve the murder. I love how the family dynamics around Lady Valeria take place, how the village avoids going against her except for Mr. Moss the mechanic who keeps junk on his property in an effort to get a petrol pump. Who murdered Grace Moss? The solution is a wild romp through Cheshire and a great cast of characters. Everyone has their own way of dealing with the Death or is order to deal with it by Lady Valeria. It was a great story of trying to eliminate the suspects and find the real murderer. I am so happy that this book will be reprinted next year, and hope the following OOP books will soon follow. Recommend reading this book if you like British Historical mysteries. Lovely to find British-style cozies from Carola Dunn. Ashamed to say, despite us living in the same city, this is the first of her books I've read. I was shooting for the first book, but got the second instead (oh, to have numbers on the books in a series! ).I've read just about all of Agatha Christie, PD James, and Dorothy Sayers (love Lord Peter). It's nice to find a whole bunch more of the same quality for my reading list. As a fan of Dorothy L Sayers and Margery Allingham, I quite enjoyed this mystery set in the Golden Age period, with an aristocratic magazine reporter, Daisy Dalrymple, as heroine. It's a very light quick read. I would read more of Daisy's adventures in the future. I don't think much of the cover, which looks as if it is a children's book! 2.5 starsThis is a perfectly nice historical cozy series and the 1920s setting gives it a certain charm. Overall, though, it's probably a little too cute for me. But if you're looking for a light book to read as a palate cleanser in between darker, more substantial books then give this series a go. That was decent but not much else. I liked the historical context - the fact that even well-established aristocratic families had trouble recruiting servants after the War. Daisy is also an interesting character, but apart from that there isn't much that makes this series different from other cozies and I don't know if I'll keep on reading. Another nice, new to me series. I hope I can hear all books by this author. Fun, cozy...a good rainy day read! This series is absolutely spiffing!Second book as solid as the first. Daisy has lost none of her charm and her sleuthing skills are improving paining DI Fletcher no end, in a good way, of course!Did not take long for a dead body to be unearthed from another country house, in the winter garden, of all places. Daisy was there to witness it all and to get the suspect ball rolling.Recurring familiar characters, strong dialogue, lovely settings and plots. The sub-plot in this one especially current and topical. Daisy is a champion for women working outside the normal 'female' jobs; she is keen on pursuing writing, journalism, photography, and so much more. A breath of fresh air is Daisy and her contemporaries!I plan to skip ahead a few books, there are 20 plus in the whole series, I shan't read them all but want to see where Daisy finds herself in a few months in the future. Do check out Miss Dalrymple and enjoy this excellent cosy mystery series with smarts! Spiffing little murder mystery with upper class folk, set in 1920’s. Daisy Dalrymple being the capable, independent, likeable gal who stumbles across murders so often ......a whole series of books can be developed.Her flirtation interest.....there has to be one.....is Detective Inspector Alec Fletcher. Harmless, enjoyable way to pass the time.If this is your cup of tea....try the Aussie version that predates dear Daisy D.Phryne (pronounced Fry-knee) Fisher is an upper class Melbourne girl with a penchant for crime...a pearl handled pistol...and a detective love interest.Series by Kerry Greenwood. On her latest assignment, aristocratic magazine writer Daisy Dalrymple witnesses the uncovering of the remains of a missing parlor maid in the greenhouse garden a grand home. The blowhard, bullying Lady Valeria, the grand dame of Occles Hall, is determined to stymie DCI Alec Fletcher's investigation, but is this she is murderer or dies she fear one her children did it? There's more action, more red herrings, and, of course, more '20s slang in this outing. Daisy ups her pluck game the minute she outs her hands in automobile crank handle. Solidly enjoyable. Another fantastic "cozy crime" series that I've been introduced to through the wonderful people on Litsy. This Daisy Dalrymple series reminds me of an English version of Phryne Fisher, just a little more innocent and a lot less rich. She's actually more like Miss Marples granddaughter, lots of smarts, chutzpah & a disarming way of making people confide in her. Highly recommended. I loved this book! Did I pick the murderer out pretty early? Yes. Did I understand most of the British lingo and humor? No. Did it remind me of Phryne Fisher, my fave lady detective? YES! I have been searching for something to tide me over until the Miss Fisher movie, and by Jove I've found it. I'm off to reserve the next book in the series from my library.